The fourth annual gathering was held on Saturday, August 11th and saw some decent weather, but a much smaller event than in previous years. The founding fathers of the event did dress up the original timing tower, but those in attendance could not get a good feel for the original track's layout as there was overgrowth of weeds, trees, etc. A number of nice race cars, show cars and hot rods were on display, but nothing historic as in the past as well. For the event to grow more thought needs to go into the inclusion of vintage race cars from the era and racers and personnel that competed at the lodge in its hay day! 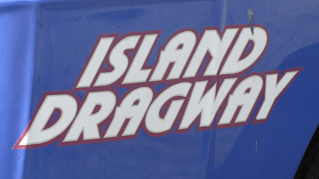 The annual gathering at Island Dragway in Great Meadows, NJ will take place on Sunday 9th. The track is a very historic facility dating back to 1960. Over the years many great events and records were set with the most epic being in August 1964 when Don "Big Daddy" Garlits became the first racer to officially record a 200 mph run during a match race against the fabled Chris Karamensines, better known as the "Greek"! The annual event held at Raceway Park or better known as Englishtown or E-Town once again was a great event with lots of vintage drag race car, racers and fans despite the shaky weather forecast. The excessively hot weather of late makes for the possibility of thunderstorms and the event did get a mid-day shower, but things got right back on schedule. The shower forced the Raceway Park staff to only permit one qualifying pass, but the majority of those in attendance didn’t mind and wanted to get the race underway. The nostalgia funny cars, always a draw, made several exciting passes that excited the crowd! Many will remember the so called “old days” and this was how it was with competitors breaking engines all the time. Of course, back then most race engines used a combination of stock parts and leaned on the can pouring a little more nitro in the tank to run quicker and faster. Wayne Meli had his beautiful replica Bill Jenkins 1976 Pro Stock Monza on display along with Larry Lombardo, the 1976 NHRA Pro Stock World Champion and driver for Jenkins. Larry talked about the great times he and Bill had while working at Jenkins Competition and traveling around the country in pursuit of the coveted NHRA Championship. Larry is a well renowned engine builder since giving up driving and builds many race engines for dirt track racers on the east coast. The 422 Allstars were also part of the show with a total of twenty-nine teams showing up for race #4. 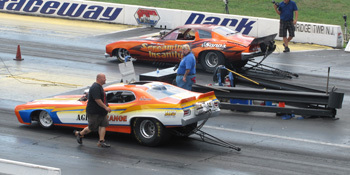 Once again the weather and oil downs slowed the program and were able to complete four rounds of eliminations pitting Gary Nies and Sean Pickett against each other for the final run and title. The drivers decided that they would split the money and points to finalize the race. In the semis, Nies took out Dan Woods who was having a great outing and on the other side of the ladder Pickett beat Bob Fort, Jr. in his Jersey Duke II Plymouth. Race #5 with be held this Saturday, August 4th at the "Glory Daze Nostalgia Race" event at Maple Grove Raceway. 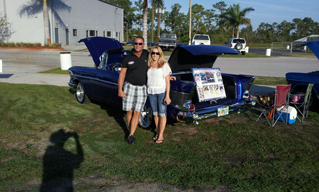 Also attending the event was Joe Black and Joe Bambace, Jr. with the 1964 altered wheelbase Plymouth that they campaigned. Joe Bambace, Jr’s. Dad Joe, Sr. drove and raced the 11th Commandment Plymouth back in the 1960’s and can be seen. 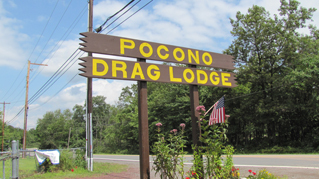 Incidentally, Joe Black has been chosen as one of the Drag Race Hall of Fame.com inductees for 2012. 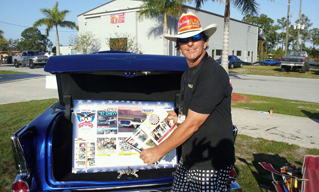 Joe will bring his car and be inducted at the Southern Nostalgia and Muscle Car Shootout at Bradenton Motorsports Park, November 3, 2012. DRHOF.com's George Case along with friends Bob and Jo Moon attended the opening ceremonies of the Alternative Energy Exhibit at the AACA (Antique Automobile Club of America) at their Hershey, PA museum. The exhibit featured a vast variety of vehicles some dating back to the early 1900's all the way up to a 2012 Fisker Karma. One of the more notable cars on display was this 1930 Rausch-Lang gasoline-electric hybrid sedan. Just goes to show you, that nothing is new and hybrid technology has been with us for almost a century! DRAG RACE HALL OF FAME.com reaches 1 year Anniversary! 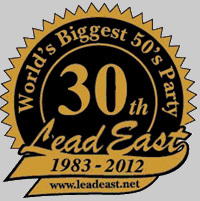 Its hard to believe that we've hit our first year anniversary, hopefully providing information about the history of Drag Racing along with anecdotes here and there about the events the DRHOF.com staff attends. 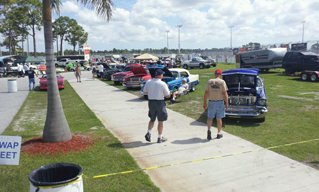 Harry Laplatte is presently in Florida attending the Super Chevy Show at Palm Beach International Raceway, plus working on a list of original owners of the Hemi powered 1964 Plymouth Savoys and other stories as well. 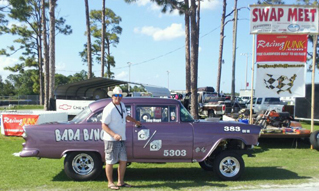 George Case will be at the North East Rod & Custom Show this weekend in Oaks, PA and will be reporting throughout the season on the 422 Allstars Nostalgia Drag Racing Series events as well as racing the 1964 Comet wagon Dyno Don Nicholson clone in the series with his son Ian driving. 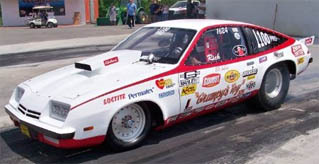 Their car runs 8.60's and was originally wheeled by Jay Zolko, who went on to win the 2007 NMCA championship in the same car. As they say, there is lots more to come....stay tuned! Copyright © DragRaceHallofFame.com, All rights reserved.